We have already covered the sense of sight, smell, and taste. Today’s behavioral economics podcast is all about the sense of hearing and sound. As a vocalist, avid music lover and podcaster, sound and the sense of hearing is very near and dear my heart. I talk about the basics of hearing and how the brain interprets signals from the ear. Then we move on to sounds, and the signals that sounds can send to our brains. Similar to the sense of smell, sound can have a huge impact on what the brain perceives. I share some fun studies and articles that involve music, pop culture, branding, and I even play some some branding sounds for you to guess. 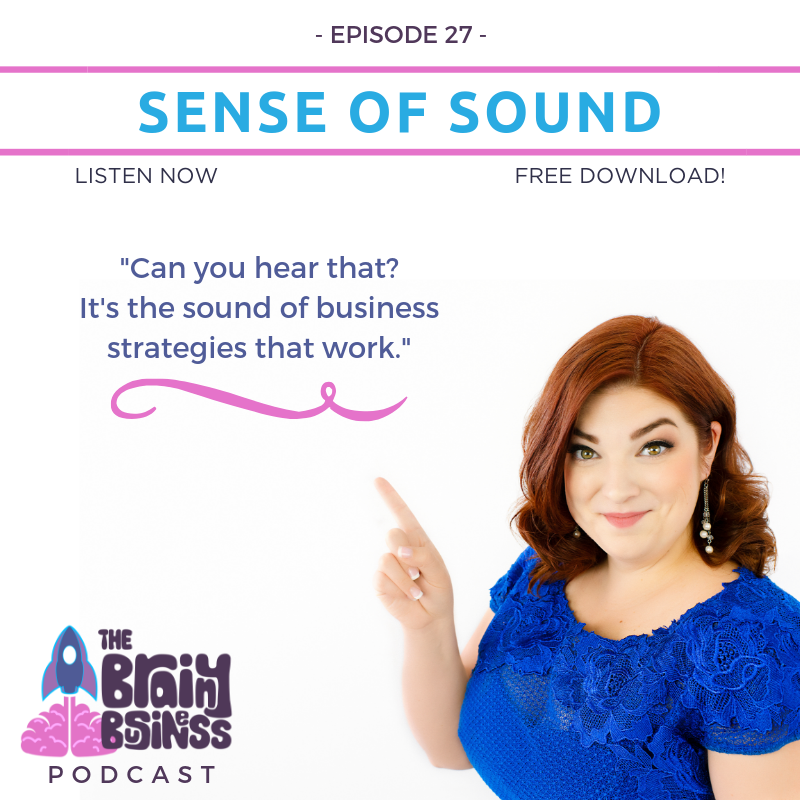 As always, everything ties back to how you can use sounds to make your business more appealing to your target market. [04:48] Sound is basically just air. It hits the outside of our ears, which help to determine where a sound is coming from as sound waves bounce off of them. [05:00] The ear canal then works like an amplifier on the way to the eardrum. [05:12] The eardrum works like a physical drum by turning the air that hits it into a physical vibration which pass along to the tiny bones of the inner ear. [05:28] This causes the fluid of the inner ear to slosh around, stimulating tiny “hairs’ in the ear which move molecules around and send signals to the brain to be interpreted as sound. [05:43] This is also what controls equilibrium and allows you to stand up and know the difference between what’s up and down. [06:12] The cochlea translates sounds into electrical pulses and sends them to our brain. [07:09] Vibration of sound waves is at the core of sound and what we hear. [07:49] Your body takes in a stimulus that needs to be interpreted by the brain to actually mean anything to you. [08:27] Hearing has a similar ability to distract and take over everything the same way that smell does. [08:49] A good smell can flag your brain in a positive way, and a bad smell can do the opposite. [09:48] Sound has a similar impact on our ability to perform. [11:48] Music is amazing and powerful. [12:30] Every culture on Earth has been found to have some type of musical component. [13:18] We truly are uniquely able to understand and create music and it impacts more than just our ears. [13:41] Studies have shown that our bodies physically react to music in amazing ways. A quick tempo in a song will make our hearts beat faster. [14:03] The body actually changes when music is played, which is pretty amazing. If you want to get pumped up before an important call – choose a great song. [14:37] The easiest way to turn any sound into music is to repeat it. [15:20] Our brains love repetition. Familiarity is favored and music is all about repeating. [15:51] Music impacts our brains differently than words and it can actually help people to heal. [16:49] Studies have shown that restaurants playing faster music can turn more clientele than those who play slower music. [17:39] Understanding how you make money can make it easy to pull the right levers. [18:51] Studies have shown that stores need to carefully select music that matches the brand to encourage shoppers to stay in a store longer. [19:18] Locations that played music that was a better fit increased time in a store by 22 minutes! [19:51] The emotion of the music can impact the way the consumer feels about the brand they are interacting with. [20:42] Everything leading up to the sale or conversation or price or item being sold matters more than the price or item itself. Everything matters. [21:13] JINGLES: Sounds have a strong connection to memory, emotion and behavior and jingles associate brands into our brains in a different way than images or words alone. [24:02] Sounds make or break movies. They say if you are ever watching a movie and get too scared to put it on mute. It completely changes the experience. [25:28] People truly can hear whether you’re smiling or not (even if they can’t see you), and it makes a difference with how they interact with you. [26:17] The study I have linked to found that the way a number is sounded out can impact the way the price is perceived – as being big or small – more than the mere number does alone. They did this by testing out the way words are formed – vowels and consonants to determine what is a “big” sound versus a small sound. [28:05] This study found that “bigger” associations in the phonetics translated to a bigger price in the brain.